Franz C. Kuhn, was born in Detroit on February 8, 1872. He graduated from the Literary Department of the University of Michigan in 1893 and from the Law Department of that institution in 1894. He began the practice of law at Mt. Clemens, Michigan, immediately after his graduation and served his county as Circuit Court Commissioner until 1896. He was then elected Prosecuting Attorney of Macomb County and in 1898 and 1900 was re-elected to that office. In 1904 he began his first judicial work as Probate Judge of Macomb County, a position he held until he resigned in 1910 in order to accept the office of Attorney General of the State. 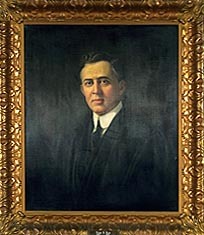 During his service, he was appointed to fill a vacancy on the Michigan Supreme Court in 1912. At the expiration of the term for which he was appointed, he was elected to and remained a member of the Supreme Court until he resigned in 1919. Soon thereafter he was appointed president of the Michigan Bell Telephone Company, where he worked until his death. Kuhn’s greatest trials resulted from the quarrels and disagreements between his friends and those whom he held dear. Physically he was very prepossessing and agreeable in his friendliness. A person who met him always remembered him and bore him in mind in a distinct and impressive sort of way.